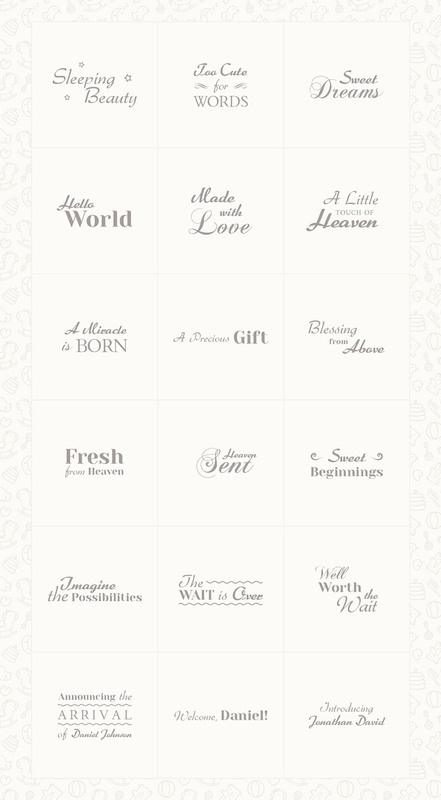 This set of 18 overlays is perfect for adding a special touch to your newborn photos. You’ll get 18 different quotes that can be easily applied to your photos in Photoshop or Photoshop Elements. The files come in .psd and .png format. There are two different versions of the .psd files. One version includes the words in vector shape format rather than text format, so you can use the overlays without needing to download any fonts. The other version includes the words in text layers, so you can edit the text as needed, but you’ll need to download the fonts first. Only free fonts were used in the overlays, and the download includes a fonts.txt file that provides links to where you can download each font. To use the overlays simply place them on top of your newborn photo, change colors to suit our needs, change the size of the overlay, and move it wherever you want in the photo. Previews of all the overlays are shown below.